You can compare your existing and future tires and / or wheels of your vehicle. You also get a nice graphical demonstration of how the tires and / or wheels look like in comparison. You can calculate values such as circumference, speedometer difference, changes relevant to the ride height or the effect of wheel spacers and learn which tires or wheels fit best for your car. 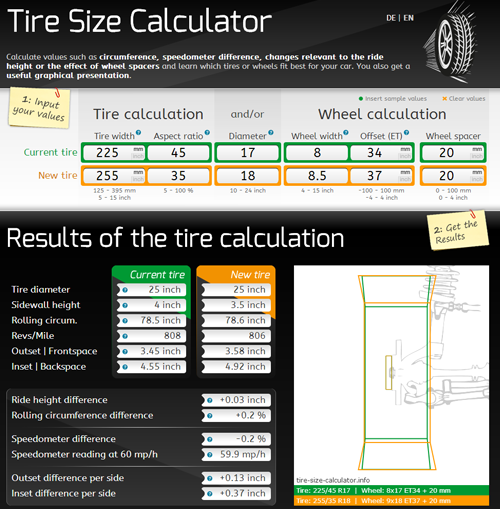 I hope the tire size calculator can help you with your calculations and helps you in deciding on which tires and / or wheels to choose! Would be nice if you have any suggestions or requests how to make the tire size calculator even more better. PS: Admins or mods are welcome to make this thread sticky to help also new members of the forum who could need this tire size calculator. I got a lot of feedback and many of you wanted to be able to input inch-values and not only metric ones. This is now possible Hope it will help you with your calculations. If you like the tire size calculator it would be great if you could recommend it also to others!